The human body is so incredible that scientists are always trying to come up with ways to replicate its unique properties. In particular, the body’s ability to heal itself would be beyond useful if it could be applied to man-made materials. A new type of self-healing plastic created by Professor Marek W. Urban at the University of Southern Mississippi works in much the same way as the human body, sealing up and healing damages when it is exposed to visible light or changes in temperature or pH. 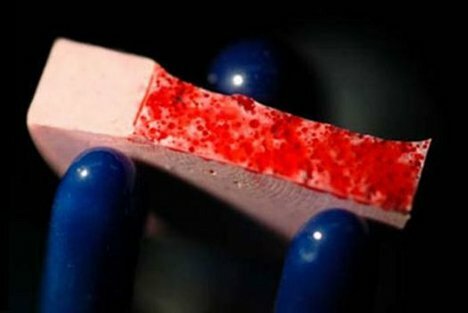 The plastic is made up of tiny interconnected “molecular bridges” that turn blood-red when broken, mimicking the appearance of a cut in skin. The plastic can quickly fill in any gaps caused by the damage when any of the above-mentioned changes occur. As the material heals and goes back to normal, the red color disappears. The amazing human-like self-healing plastic could one day protect our laptops, phones, cars and even soldiers, giving a visual indicator when damage has occurred and needs attention. See more in New Materials or under Science. April, 2012.